Pick pears before they are mature but not fully ripe, then allow them to ripen off the tree. If you leave them on the tree to ripen, they tend to spoil from the inside out. The outside looks good, but when you cut them open, the inside is soft and brown. For longest storage – keep unripe pears at 30 °F (-1.1 °C) and 85-90% humidity. Fresh, unripe pears will hold in these conditions for 2-5 months, depending on the variety. The high sugar content of pears acts as a natural antifreeze. These varieties should keep 3-5 months. Bartletts should keep 2-3 months in optimal conditions. Pears can be rock hard straight off the tree and still ripen beautifully in storage. The firmer the pear, the better it typically will hold in storage. Temps colder than 30°F will damage the pears, warmer temps will speed up ripening. Even if you don't intend to keep the pears very long, brief chilling will improve the flavor. Most store pears have already been chilled during transport and are ready to ripen. The longer the time spent in cold storage, the more quickly the pears will ripen at room temp. A spare fridge or walk in cooler is ideal, although I found that the new mini fridge we purchased for storage does not work well because it is too airtight. Ethylene gas cannot escape, and food tends to spoil. My husband's old dorm fridge worked better, but it died at around 25 years of service. It's best to lay out your fruit in shallow bins or containers that you can inspect regularly. 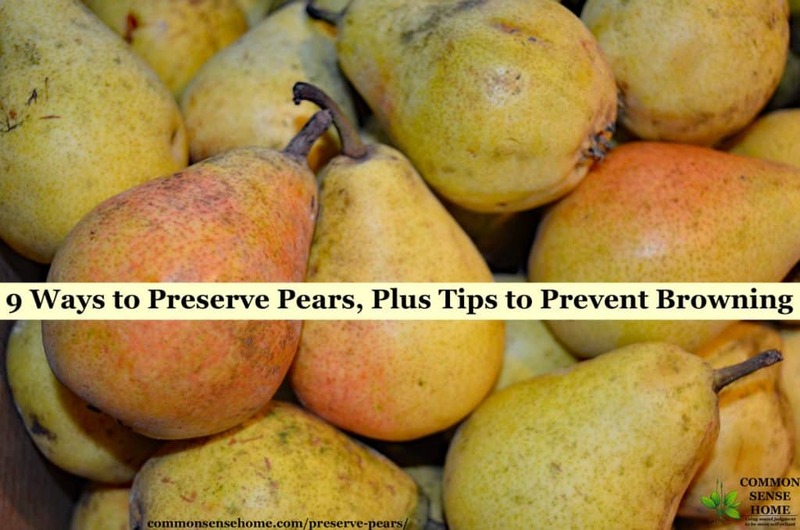 Remove any fruit that shows signs of spoilage and use or preserve pears via another method. Once ripe, pears should be used within a couple of days. No matter what treatment you use, it will only slow down browning, not completely prevent it. It's best to work in batches or get some help for processing so pears don't sit too long cut. If you don't have cold storage, dehydrating is probably the next easiest way to preserve pears. Due to their high sugar content, pears take quite a while to dry, roughly 10 to 24 hours. The resulting dried fruit is very sweet, like pear candy. Some people think it resembles the taste of caramel. Pears should be dehydrated at 135 ºF/57 ºC overnight or until fruit is dry and leatherlike. 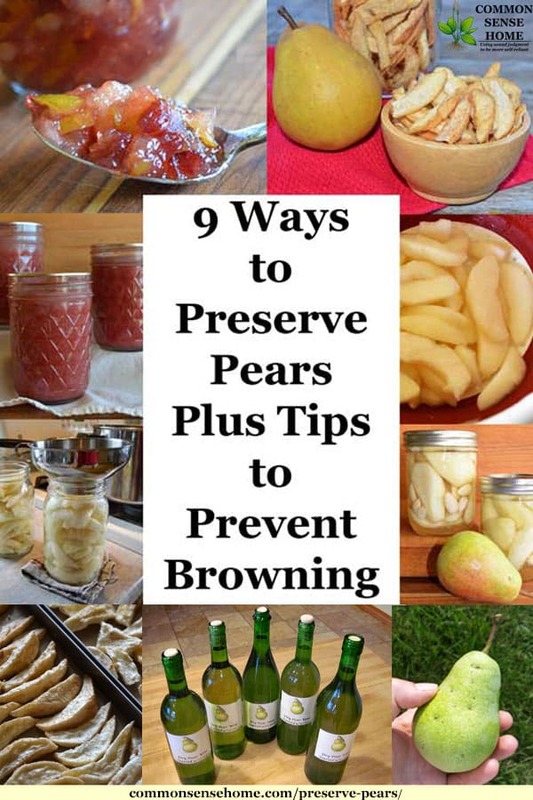 Pretreating will help keep the pears from browning, but is not required. Store dehydrated pears in an airtight container. 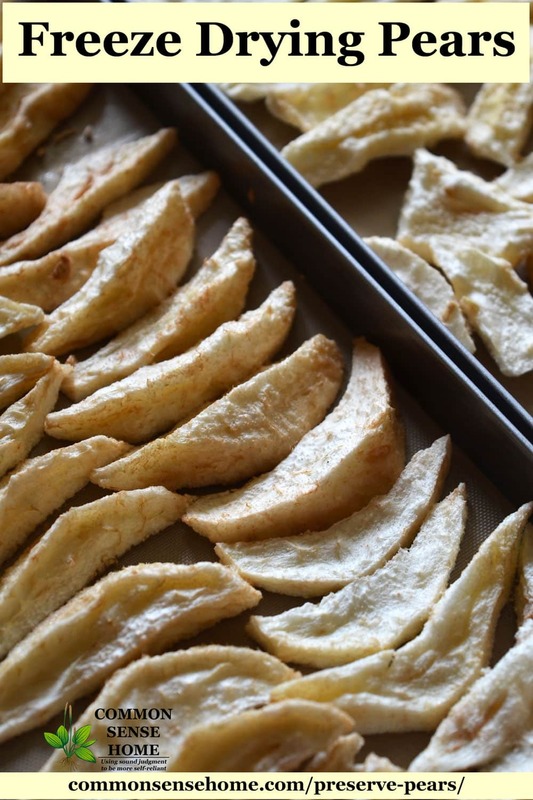 For detailed step by step instructions on drying pears at home, see the post How to Make Pear Candy. Again, this is a super easy pear storage method. Like most of my pear storage, I prefer to peel, quarter and pre-treat the pears before freezing to keep them form browning. If you like to be able to pour out a small amount of pears from your freezer storage, freeze the fruit on trays first. After fruit is frozen solid, pack in zip top freezer bags or freezer containers, or vacuum seal for longer storage. You may also pack sliced pears in sugar syrup (see below) or juice in containers and freeze. For a light syrup, use 2 1/4 cups sugar and 5 1/4 cups water. You may also substitute honey for the sugar and reduce the amount to 1 cup, or can the pears in apple or pear juice. Spices, such as a cinnamon stick, may be added to each jar or container during canning or freezing. For 7 quarts of pears, I used a little less than 2 batches of light syrup and 18 pounds of pears. It's generally recommended that pears be gently heated in syrup before being packed in jars, but I have raw packed very ripe pears to keep them from turning to mush. To can pears, you should use a water bath canner. Wash and drain pears. Peel, core and cut into halves or quarters and treat to prevent darkening. Make syrup and keep hot. Drain pears. Fill jars with pears, leaving 1/2 inch headspace. Ladle hot syrup into jars. Use thin plastic spatula or chopstick to remove air bubbles. Add extra syrup, if needed, so that jars are filled to 1/2 inch headspace. Wipe rims and screw on two-piece lids finger tight. Process pints for 20 minutes and quarts for 25 minutes in a boiling water canner. Turn off heat and allow to sit for 5 minutes. Remove jars from canner and place on towel to cool completely. Remove rings and check seals. Wipe any spills or drips, label and store in a cool, dry location out of direct light. Use within 1 year for best quality. This works best with firm, ripe pears. After pre-treating, drain pears. Heat pears in the syrup until hot throughout. Pack into jars, leaving 1/2 inch headspace. Remove air bubbles and add liquid, if needed. Process as above for cold pack. Almond pears are pears canned with almond liquor and blanches almonds for a delicate almond flavor. 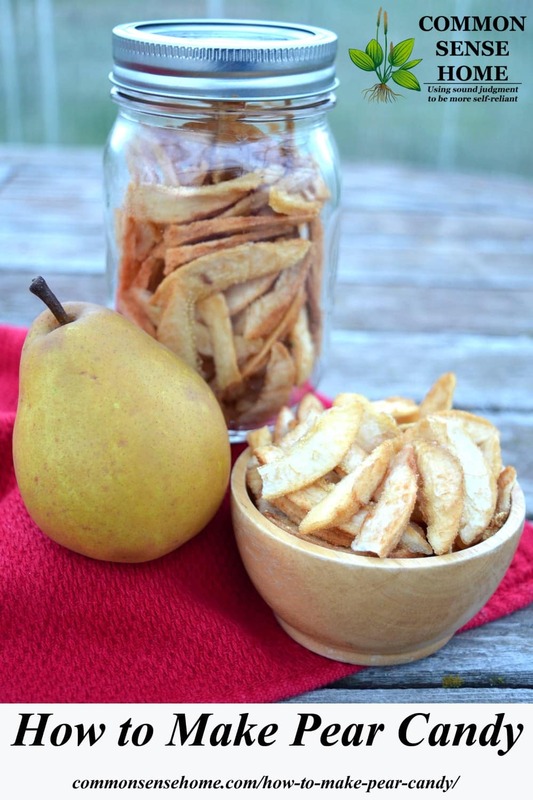 Check out the step by step canning instructions and recipe in the post, “Almond Pears“. Although pears can be freeze dried, they take a really LONG time in the freeze dryer due to their high sugar and water content. If you try it, I suggest using less ripe pears and slicing them very thinly. To freeze dry pears – simply peel, thinly slice and treat to prevent browning. Drain completely – you may even want to pat them dry with a clean flour sack towel. Spread pears on freeze dryer trays in an even layer. Do not exceed 10 pounds total for unit. Run freeze drying cycle and check for dryness. Add extra drying time if any large pieces test cold in the center. Freeze dried pears will be slightly tacky on the surface, but the center of the fruit should be dry and crisp. Seal in a Mylar bag or vacuum sealed mason jar with oxygen absorber. Label, date and store in a cool, dry location out of direct sunlight. 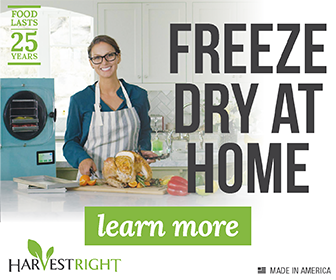 Learn more about Harvest Right Home Freeze Dryers. I like to pair pears up with other flavors in jam, since pears on their own can be very bland. Jam is good way to use up pears that are too soft for canning or drying. My favorite pear jam recipe is cranberry pear jam, which combines two favorite fall flavors. 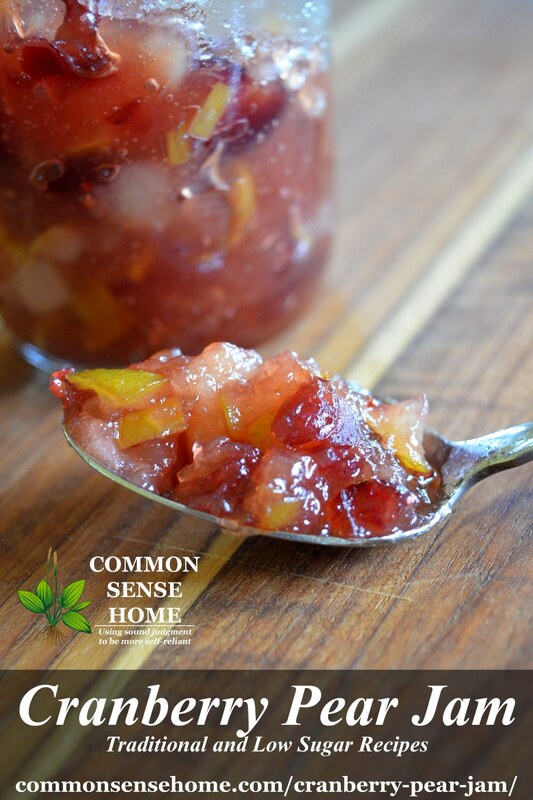 The cranberry pear jam post features both traditional and low sugar versions of the recipe. Blueberry pear jam is another interesting flavor combination. While not as entirely seasonal in our area, it's fun to combine fresh and frozen fruit to make unique jams you can't find anywhere else. When I have more pears than I can freeze, can, dry and otherwise preserve, or if the pears get really ripe, it's time for wine! With just a few pieces of basic equipment, you can make a simple country wine right in your own kitchen. 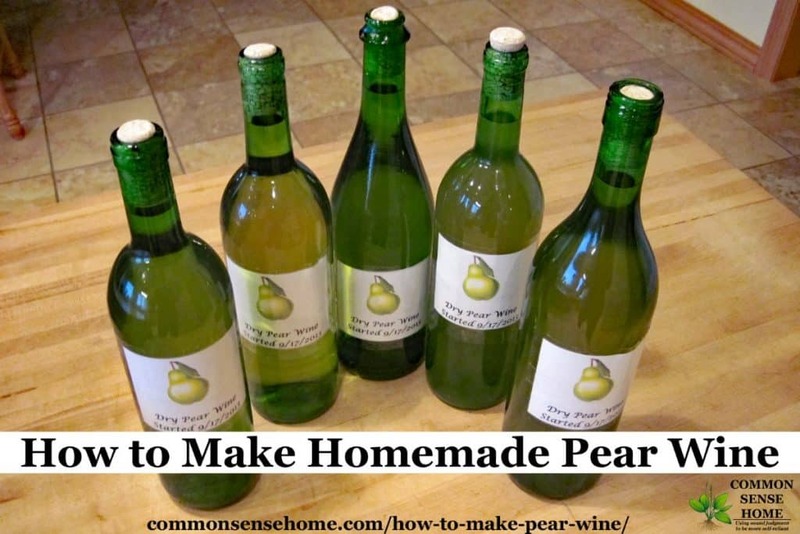 See “How to Make Pear Wine” for my pear wine making story and recipes. There are a ton of pear butter recipes out there, but I like to keep mine super simple. Very ripe pears are best for pear butter. Because the pears are so naturally sweet, I don't add extra sugar. I simply core and peel the pears, cutting out any damaged spots. Pre-treating isn't needed, since the butter will turn brown with cooking. That said, adding a little lemon juice or orange juice to the pot brightens the flavor and ensures the pH is low enough for safe canning. Place the cleaned pears in a heavy bottomed pot with a bit of water to prevent scorching. Add roughly 1 tablespoon of lemon juice or orange juice per quart of pears. Cook gently on low heat, stirring regularly, until pears are soft and smooth. Cook off excess water until desired consistency is reached, stirring more frequently as the butter gets thicker. When you are ready to can, you may process “as is”, or add spices of choice such as cinnamon, nutmeg, cardamom, vanilla or citrus zest. Fill jars to 1/4 inch headspace and process cups or pints for 10 minutes in a water. Allow to cool on a clean towel, remove rings, wipe down and label jars. Store in a cool, dry location, out of direct sunlight. Enjoy Your Pears Year Round! Dried pears are great in granola or snack mixes, or baked into oatmeal or cookies. Blend individually frozen pears into smoothies or fruit sorbets. Canned pears make a tasty dessert straight out of the jar, or blended into smoothies. Use your imagination! What's your favorite pear variety or way to store pears? I'd love to hear from you! Originally posted in 2016, updated 2018. At first glance, thought it said, How to Preserve “Bears”. Indeed it would! For better or worse, no bears in my immediate area that need preserving, although my brother sees plenty up by his place in northwest Wisconsin. Thanks for the good ideas, I may try the pear butter this year. I like the idea of pairing the pears with a tart berry like cranberry in the pear butter will make it more interesting on toast. Wonder what pear/rhubarb would come out tasting like??? figs. It all get soaked for several weeks in Jamaican Rum and and a bottle of Ruby Port. After a month of soaking I blend the fruit and liquid and use it for the base of a yummy Rummy Fruit cake batter that has lots of butter. I also find the riper the pear the more caramel like they turn out. I mean really ripe. Yes, as they ripen, the sugar content gets crazy high. Very sticky, but very sweet! The fruit cake sounds amazing. 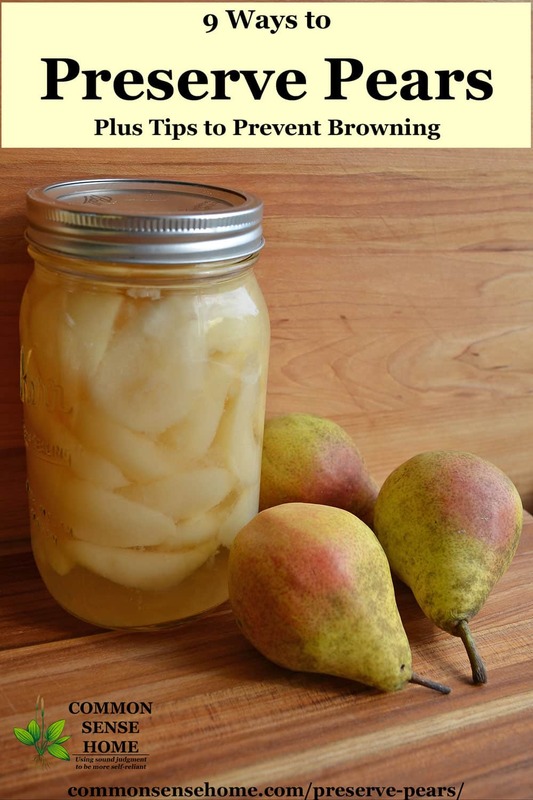 This is one of the best, most informative blogs on preserving pears! Thank you so much for sharing your experience with us. I have a question. My mom has a pear tree and I peeled, cut, and froze tons of pears once they were ripe. Can I use those to make pear jam/preserves/butter? and if so, how does it change the recipes listed above? Glad you like the post, Shelly. You should certainly be able to use frozen pears for the cooked pear spreads with no problem. For jam or preserves, I’d partially thaw and chop, then use “as is”. For pear butter, I’d let the pears thaw completely in a colander to drain off excess juice, then cook them into butter to reduce cooking time. Plus, you can also drink the drained juice. Lucky you! This year the weather in our area was not cooperative, so none of the neighbors had pears to spare. I’m thankful we still have some in storage. I am wondering if i can can pears in brandy or a spiced rum mixed in with a light syrup and if the jars are hot and the syrup is hot, do I still need to process. I really do not want mushy pears. This would be similar to the almond pear recipe, and yes, you really should still process the jars for 10 minutes in a water bath canner. Most fruit (but not all) has a pH of less than 4.6, which is mildly acidic. This acidity helps to inhibit the growth of some pathogens, including botulism spores. Add a sugar syrup, and sugar ties up some of the free water in the fruit, which helps to keep the fruit firmer during storage. Bacteria and other microbes need free water to grow, and the sugar bonds to the available water, again inhibiting microbe growth. The syrup also covers the surfaces of the fruit, preventing exposure to oxygen and helping to maintain the color by preventing oxidation. Add alcohol, and it acts much like sugar – drawing liquid out of the fruit and inhibiting microbe growth. When you process foods in a water bath canner, the goal is not just to seal the jars. Any canner who’s screwed a hot lid on a hot jar can tell you that seals can happen without processing. Water bath processing times are specifically calculated to drive all the air out of the head space of the jar (the space between the food and the lid). (Note – this means it’s also important to get the headspace correct.) No air = no oxygen trapped in the top of the jar to provide a breeding ground for microbes at the top of your food where it’s not safely submerged below the syrup. Also, the ten minutes of boiling makes sure that the sealer in the ring is soft so it can bond as it should. When you find a jar of canned food that spoiled, the spoilage always starts at the top. Proper processing adds an extra layer of insurance to your canned foods. To keep your pears firm, can them when they are just slightly underripe for fresh eating. Soft pears going into the canner = soft pears coming out of the canner. Also, when/if heating in the syrup, just heat through, don’t cook for an extended period of time. Brown pear jam, okay with me when it’s for me, but I’m making a batch for the neighbor’s girl. Her favoritest Christmas present, spiced jam. Any recommendations to prevent this browning? It’s coming out caramel color and that’s with cooking on the lowest heat my stove does. Thank you for any info or suggestions you may have. Does your jam recipe use lemon? Mine do, and I toss the pear bits with the lemon juice as I prep them to help cut down on browning. Also, if the pears are slightly less ripe (not to the point of completely mushy) they will oxidize a little more slowly.